This is an image from a food tasting event for the local vendors coming to the Warriors arena in San Francisco on Monday, April 3, 2017. SAN FRANCISCO (KGO) -- Planning and building are well underway for the Golden State Warriors new arena coming to San Francisco. Warriors officials say they hope the new arena will become a foodie's paradise. On Monday the team announced a new partnership with Bon Appetit Magazine to offer food with Bay Area roots. Fans will be able to chow down on chicken sandwiches from Oakland's Bake Sale Betty and tacos from San Francisco's Tacolicious. 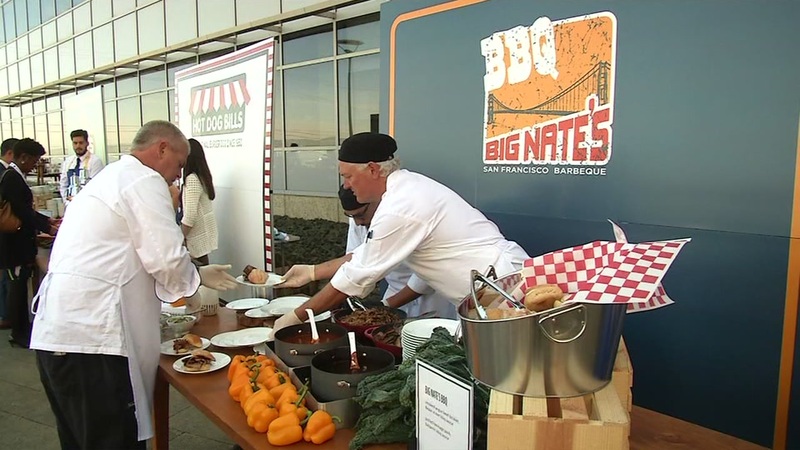 In honor of Warriors Hall-Of-Famer Nate Thurmond, the team is bringing back Big Nate's Barbeque with Thurmond's original recipe.